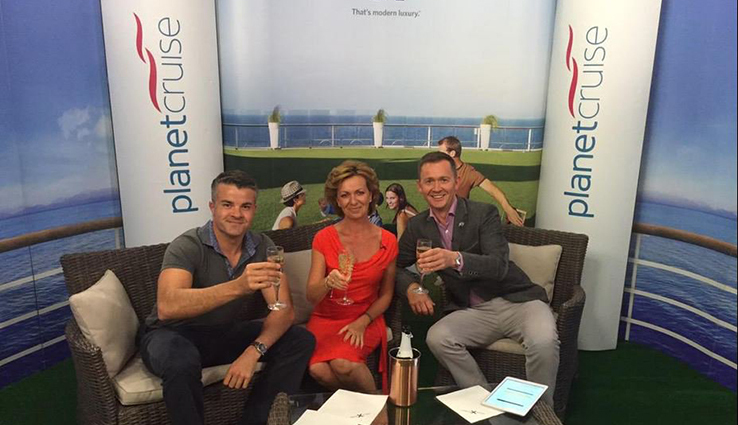 Time flies when you’re having fun and that can certainly be said for the Planet Cruise team as we aired and celebrated the 500th Planet Cruise TV Show on Ideal World TV this month. 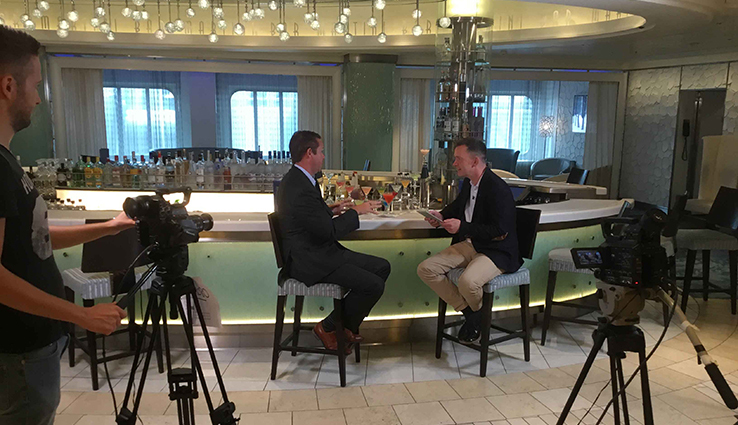 Planet Cruise TV has been running for eight of the ten years that Planet Cruise has been actively advising and informing cruise fans and customers nationwide. The popular live TV show airs weekly on the Ideal World Shopping channel and features detailed cruise and destination information, real time cruise offers, cruise news and expert top tips. Presented by cruise enthusiast and TV host Shaun Ryan, the show also features appearances from Planet Cruise experts (Justin Hazell, Glenn Wallis) and cruise industry professionals from a variety of cruise lines. Representatives from Celebrity Cruises, P&O Cruises, Fred. Olsen Cruise Lines, Royal Caribbean International, Carnival Cruise Line and more frequently join our hosts on the sofa to share exclusive news and cruise updates. 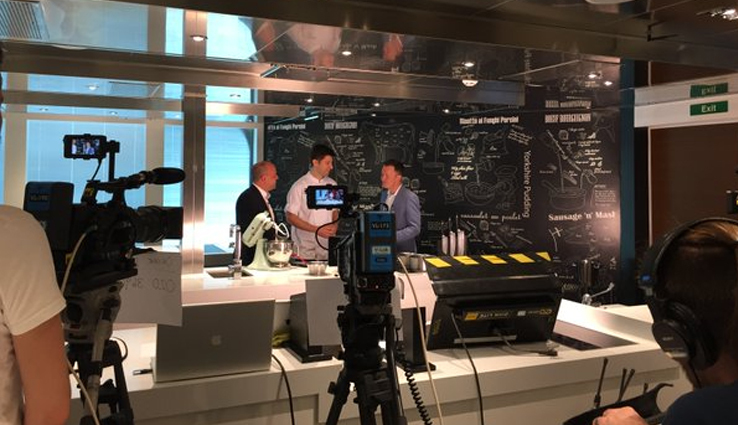 With live TV anything can happen and our hosts and guests often interact with socially active viewers on twitter, reading out live tweets and connecting with our passionate cruise audience. The show is also hugely accessible with catch up episodes made available on YouTube the day after airing. Stepping outside of the studio comes naturally to the team and we have had the pleasure of filming many overseas shoots in some incredible locations. Filming away has included us boarding Azamara Journey on the Amalfi Coast, Queen Mary 2 in New York and stepping on board Britannia to interview the crew and captain Paul Brown himself. The team have also filmed on board Celebrity Eclipse, Carnival Vista, MSC Fantasia, Braemar, Magellan, P&O Ventura and many more. Offering virtual tours and exclusive footage so that viewers can get to know a ship before they choose their cruise. Live filming and a direct hotline from the Portsmouth based call centre means that immediate new deals can sometimes be called in and announced during the show! Frequent giveaways and exclusives add to the fun and the atmosphere is always an exciting one. You can tune in to the show every Tuesday at 20:00, Ideal World TV. Sky 654, Freeview 22, Freesat 812, Virgin 747.